Is the real proof that age is just a number, Stallone looks increasingly better. Even if he has not competed on the stage of bodybuilding, Slye was trained with Schwarzenegger and Columbu, and other giants of his time. Not only he has developed a body famous worldwide, but he also maintained it. With each movie, he seems to be better built and better defined. In fact, the best performances he had, were after the age of 60 years. He is an inspiration for all those who share a passion for fitness and bodybuilding. Zane had a classic physique, which is still a standard for bodybuilders and nowadays. He masterfully squeezed each potential muscle groups, to obtain the classic shape of the ' V ' of the body. He knew that only a few hundred grams of muscle in certain places creates the impression of strength and size. Unlike the ' monsters ' in today's bodybuilding, Zane has won Mr. Olympia with a weight of just under 90 kg. Even if you prefer 'the monsters' today in bodybuilding, you can't respect Zane's physique, he seems to be sculpted with the chisel. He completed, after 10 years at retirement, at Mr. Olympia, and currently trains new hopes of the bodybuilding. Renowned for incredible physical shape, Serge Nubret entered the professional circuit after only a few years of training. His famous, long and brutal workouts have shown that it's never too much training. When a beginner worries that he may get overtrained in 4 sessions per week, the veterans remember them about Serge. Yes, it is good to rest and eat according to the workouts, but Serge has shown that the body can adapt to anything. Arnold said that Serge reminds him of a race horse because you could see him working on the muscles under the skin when you work out. He is an example for many people who want to gain muscle without being so massive as the bodybuilders nowadays. Dubbed the 'shadow', because it was a very discreet person, Dorian Yates is probably the most impressive Mr. Olympia so far. Bodybuilding took him from the streets of England and has steered clear of trouble. Even if Lee Haney, owner of the Mr. Olympia title before Yates was big, Dorian Yates led muscle mass to a new level. His brutal workouts, focused only on large weights, remain today a benchmark, and his film ' Blood and Guts ' still inspires, even if there are more than 20 years after its initial release. Bodybuilders are always defined for bodybuilding contests, but Dorian Yates has reached a level of definition that has wowed the judges at the time. Secret or dedication was huge. Was very rarely breaks, and have a clean diet all year round. Eat once in a while a few meals, and note the exact calories and macronutrients. Humble beginnings in Austria and the success that took the stage and beyond made Arnold Schwarzenegger one of the best known and loved bodybuilders of all time. He is famous for his obsession for workouts and competitions, obsessions that will serve him in other aspects of life. As many others in the golden age of bodybuilding, tinea of overtraining, and hard training, at times and five hours a day. 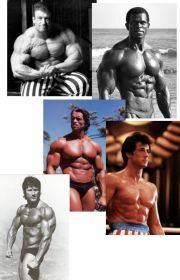 After winning 7 times Mr. Olympia, he took his talent and physique to Hollywood, acting in movie after movie. He had two warrants as the Governor of California. Arnold is an example of incredible dedication and ambition.